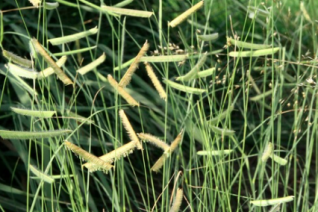 Mosquito Grass or Gramma Grass is a widespread native of the interior west. Slowly spreading to form substantial clumps of fine light green/gray leaves. To 18″ tall the funny flowers born at the tips of the fine stems feature a horizontal inflorescence- to me it resembles a little blond mustache. Blooms appear in midsummer and are attractive well into fall. Full, hot sun and rich to average well drained sites. Mass for a fine textured effect of a blowsy low meadow. In autumn as it enters dormancy it retains a dried to cere presence deep through winter. It may be cut back hard in spring. Light summer water though extremely drought tolerant when established.